The Young Journalists Forum, Nigeria, organisers of the monthly Youth Dialogue in collaboration with the Ambassador of Ecuador in Nigeria, Mr. Leopoldo Rovayo, has felicitated with the government and people of Ecuador, over the successful Presidential election that was won by Socialist, candidate Lenin Moreno, an astute Politician. In a statement by the Coordinator and Secretary of the Forum, Comrades Chukwuma Nzeh and Ene Okon respectively, and reads "We join well meaning members of the global community, to commend the government and good people of Ecuador on the successful Presidential election that elected an experienced writer, Lenin Moreno, as President elect, as was announced by the National Electoral Council's Pablo Pozo." We urge Ecuadorians to join hands with the government of His Excellency, Rafael Correa, who during he tenure has further consolidated on democracy and united the people of Ecuador, while laying the foundation of the Ecuador, of the peoples' aspirations. " The manifesto of the Socialists' is poised to empowering more young people, as confirmed by Moreno that he would create more jobs and more access to higher education among others. 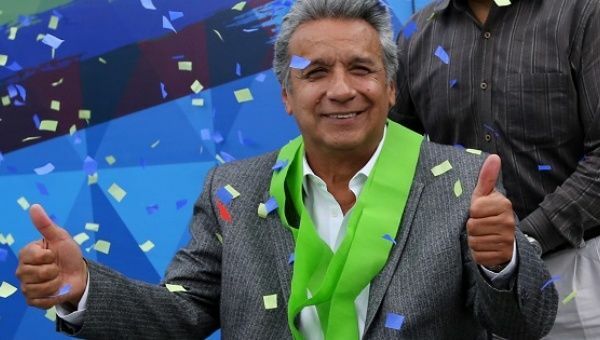 We urge all Ecuadorians, especially the Conservatives' and their Presidential candidate Guillermo Lasso to support the transition process and the incoming government of Moreno towards the actualization of the dream Ecuador. We also commend the Ambassador of Ecuador in Nigeria, Mr Leopoldo Rovayo, who has enhanced the knowledge of Nigerians on how to collaborate with Ecuador for mutual benefits, and has strengthened several partnerships, like the Youth Dialogue, where salient national and global issues are being discussed.